Translated by DOGGYFRIEND.COM. Original text is indicated above in Japanese. 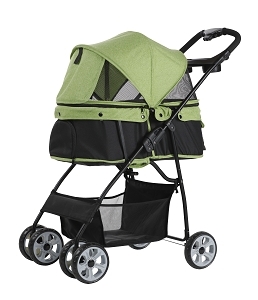 This stroller is purpose built for the comfort of your pets when you go out! 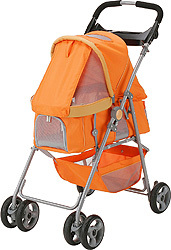 Ideal for small-sized dogs, aged dog to enjoy a family day out. The unique selling point here is the suspension built onto the nose-wheel. If the straight advancing fixed lever of the nose-wheel is lowered, it will try to stabilize with the slope. Even when the path is uneven, it can still move forward. . There is also 2 small-sized anti-spring-out lead attached to the basket. It allows your pets to pop out their heads to see the view but prevents them from jumping out. The basket attached below can accommodate all your doggie “Barang Barang” ! There is even a drink holder attaching to the handle bar of the steering wheel! 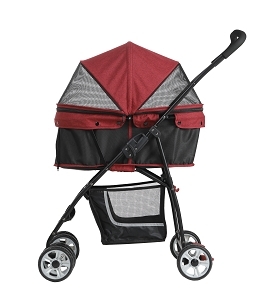 With one-touch of a button, the height of the steering wheel can be adjusted to 3 different levels to suit mummy or daddy pushing the stroller! 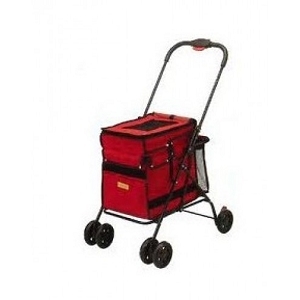 When you want to keep, just pull the Folding Lever and it will keep itself in a compact way! A knob is attached for your convenience during transportation. The difference between DC-205 and DC-206 is just the colour. Dimensions and functions are the same. Our units are brand new and still in a box - unassembed. If you want us to assemble it for you, please indicate it in the "Special Instructions" column.